Vlasta Pospíšilová’s destiny is puppet film. She graduated from the school of arts & architecture and design in puppeteering and scenography. She has become a renowned animator and in the 1970’s also a director. Her extensive filmography includes for example Maryška and Wolf Castle (O Maryšce a vlčím hrádku, 1979) and Mrs. Poverty (Paní Bída, 1984). Famous are also her adaptations of Jan Werich’s stories Greedy Barka (Lakomá Barka, 1987)¸Three Sisters and One Ring (Tři sestry a jeden prsten, 2006) and The Hat with a Jay’s Feather or The King Had Three Sons (O kloboučku s pérkem sojčím anebo Král měl syny 2011) for the Fimárum trilogy. 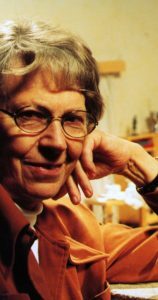 The Třeboň visitors will have a chance to remember all the creative positions of the “first dame of Czech animation.” Anifilm will screen films that Vlasta Pospíšilová worked on as an animator as well film directed by her. A special showcase will present curiosities such as puppet animation – a puppet double of a live actor playing Mr. Tau that she created for the popular TV series. The fans of the famous Pat & Mat can look forward to their own showcase, children can look forward to a special selection of Beetles (Broučci) directed by Vlasta Pospíšilová.